I realized that most of the vegan meals I know and love are basically just a huge pile of fresh fruits and/or veggies – which is not the most convenient vegan food to take camping or backpacking! Even though your meals on the trail might not be *quite* as healthy as your vegan meals at home, they can still be delicious. We’ll start with a classic staple – combine any of these items: Your favorite nut butter, jelly/preserves, Justin’s Chocolate Hazelnut Butter, granola, and/or re-hydrated dried banana chunks on a bagel, bagel thins, tortilla wraps, and/or crackers. Make it a meal by adding your favorite bar (some Larabars, Lunabars, and Clif bars are vegan, check ingredients first,) or an apple, I like to carry a piece or two of fresh fruit after a resupply, and some fruit leather. Dehydrated hummus, add in oil for calories, and any spices for extra flavor, then spread on a bagel, bagel thins, crackers or a wrap. Top with fresh or dehydrated mushrooms. Make it a meal by adding one or two Primal vegan jerky strips and some dried fruit. 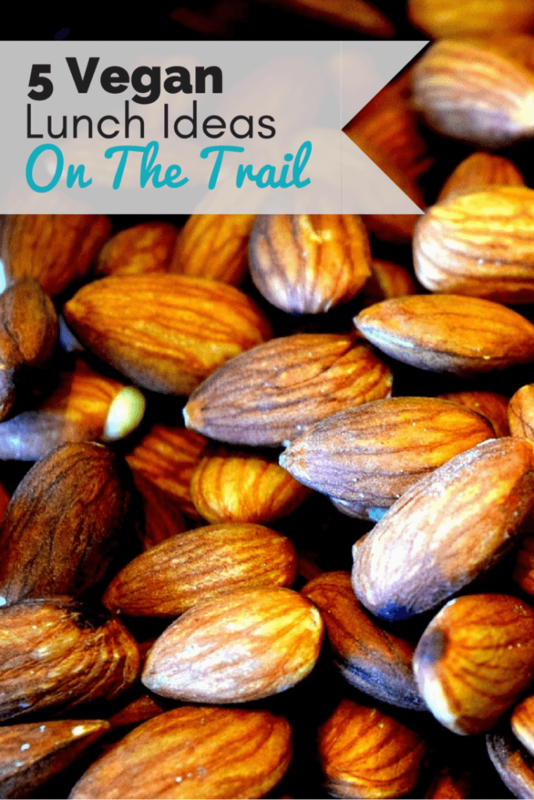 The walking lunch, if you’re into hiking through lunch and munching along the way, fill your pockets and pouches for the day with your favorite nuts, fresh or dried fruit, dried edamame and crunchy chickpea snacks, a bar and/or your favorite vegan cookies. If you’re okay cooking a lunch every once in a while, cook up some rice noodles or vegan ramen, add in some oil, spices or seasoning and dehydrated veggies and enjoy. Or add in peanut butter, soy sauce, and hot sauce for Thai-style noodles. Finish it all off with your favorite vegan chocolate bar. Pack yourself a double serving of a dinner to make towards the end of your trip or close to resupply, when your food bag is lighter, and keep the leftovers for lunch the next day. I like to cook up a mix of quinoa and rice with dehydrated veggies, oil, and then crunch up a bunch of wasabi seaweed snacks to mix in. Then put the leftovers in a Ziploc bag, in your pot if your worried about squashing it, and then enjoy it cold the next day. I know a lot of vegan hikers (heck, even non vegan hikers) get tired of peanut butter pretty quickly. Variety is key here! That’s what I love about this, once you find your favorite, dried vegan snacks and treats – they are all pretty much mix and match. 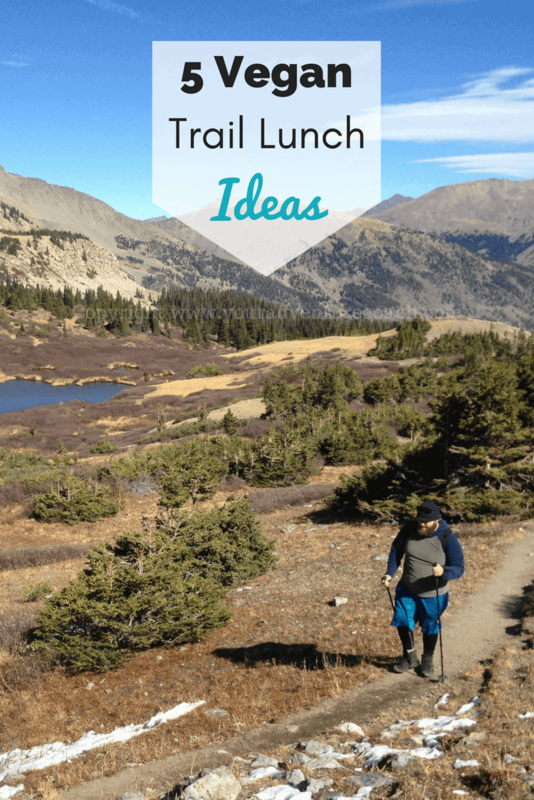 Let me know your favorite vegan backpacking lunches in the comments below! I love this ideas – hadn’t thought of dried chickpeas but now that sounds delicious!